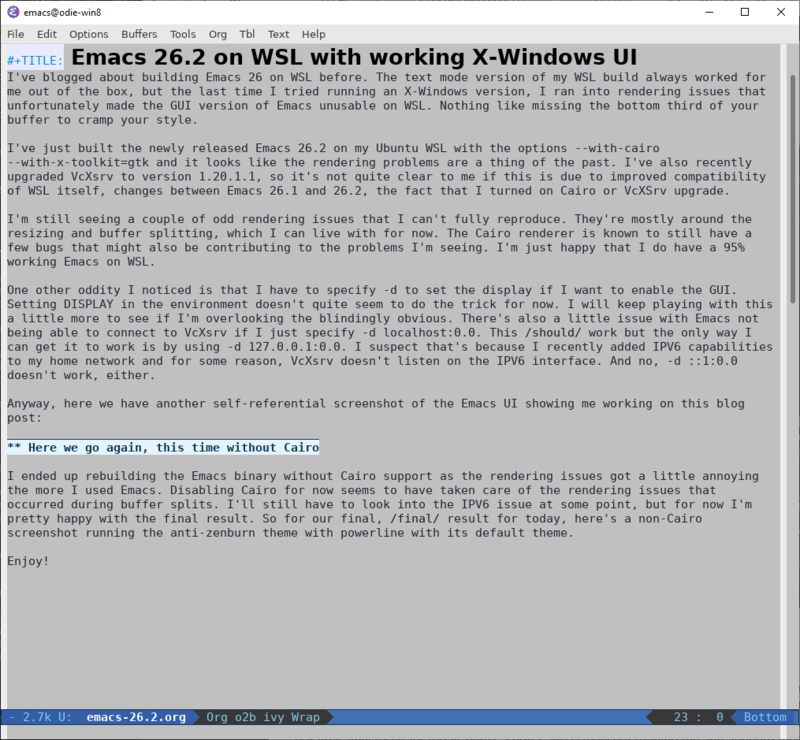 I’ve blogged about building Emacs 26 on WSL before. The text mode version of my WSL build always worked for me out of the box, but the last time I tried running an X-Windows version, I ran into rendering issues. Those rendering issues unfortunately made the GUI version of Emacs unusable on WSL. Nothing like missing the bottom third of your buffer to cramp your style. Or your editing. 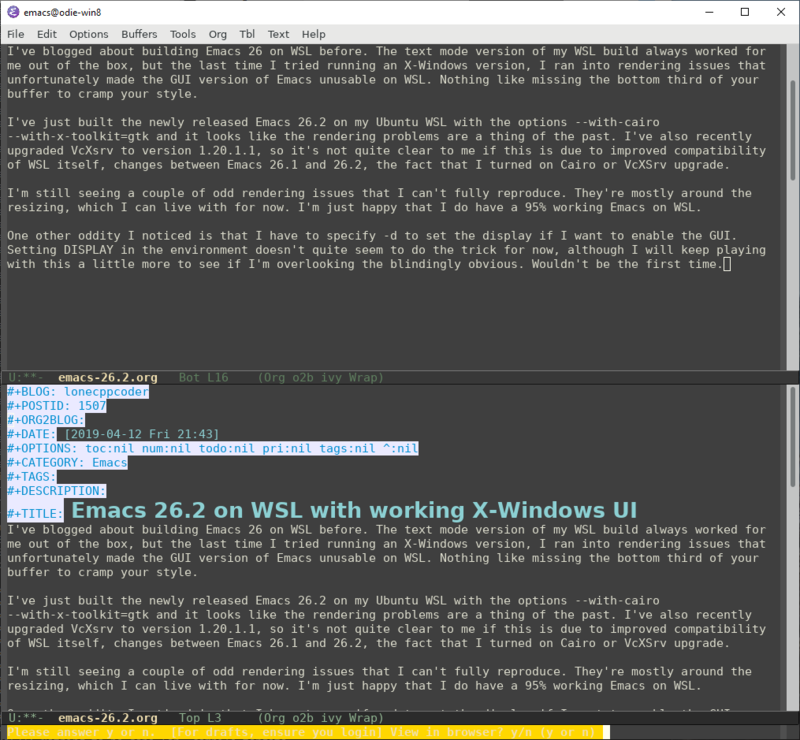 I’ve just built the newly released Emacs 26.2 on my Ubuntu WSL with the options –with-cairo –with-x-toolkit=gtk and it looks like the rendering has improved massively. I’ve also recently upgraded VcXsrv to version 1.20.1.1, so it’s not quite clear to me if this is due to improved compatibility of WSL itself, changes between Emacs 26.1 and 26.2, or the fact that I turned on Cairo or VcXSrv upgrade. I’m still seeing a couple of odd rendering issues that I can’t fully reproduce. They’re mostly around the resizing and buffer splitting, which I can live with for now. The Cairo renderer is known to still have a few bugs, so that might be contributing to the problems I’m seeing. I’m just happy that I do have a 95% working Emacs on WSL. One other oddity I noticed is that I have to specify -d to set the display if I want to enable the GUI. Setting DISPLAY in the environment doesn’t quite seem to do the trick for now. I will keep playing with this a little more to see if I’m overlooking the blindingly obvious. There’s also a little issue with Emacs not being able to connect to VcXsrv if I just specify -d localhost:0.0. This should work but the only way I can get it to work is by using -d 127.0.0.1:0.0. I suspect that’s because I recently added IPV6 capabilities to my home network and for some reason, VcXsrv doesn’t listen on the IPV6 interface. And no, -d ::1:0.0 doesn’t work, either. I ended up rebuilding the Emacs binary without Cairo support as the rendering issues got a little annoying. Disabling Cairo seems to have taken care of the rendering issues during buffer splits for now. I’ll still have to look into the IPV6 issue at some point, but for now I’m pretty happy with the final result. So for our final, final result for today, here’s a non-Cairo screenshot running the anti-zenburn theme with powerline with its default theme. Ben Simon has a post up on his blog describing how he set up a scheme development environment on his Galaxy S9 Android phone. It was also an especially timely post as I had been eyeing a Mac Quadra with a Symbolics Lisp Machine extension card on eBay. As if we needed another reminder just how powerful current phones have become! 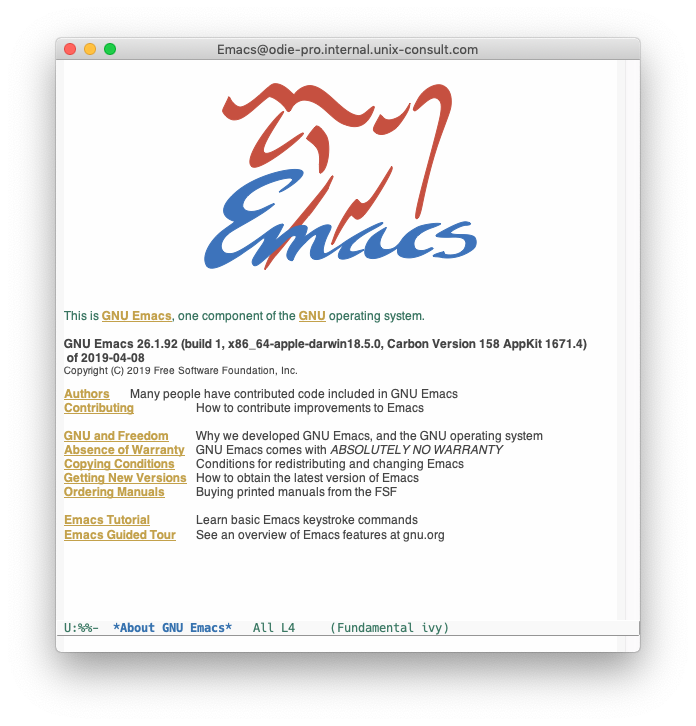 Saw the announcement on on the GNU Emacs mailing list this morning. Much to my surprise, it’s also already available on homebrew. So my Mac is now sporting a new fetching version of Emacs as well :). I’ve been running the release candidate on several Linux machines already and was very happy with it, so upgrading my OS X install was pretty much a no brainer. I’ve previously blogged about using Emacs to convert line endings and use it as an alternative to the dos2unix/unix2dos tools. Using set-buffer-file-coding-system works well and has been my go-to conversion method. That said, there is another way to do the same conversion by using M-x recode-region. As the name implies, recode-region works on a region. As a result, it offers better control over where the line ending conversion is applied. This is extremely useful if you’re dealing with a file with mixed line endings. 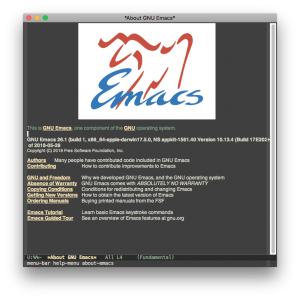 As posted in a few places, Emacs 26.1-RC1 has been released. 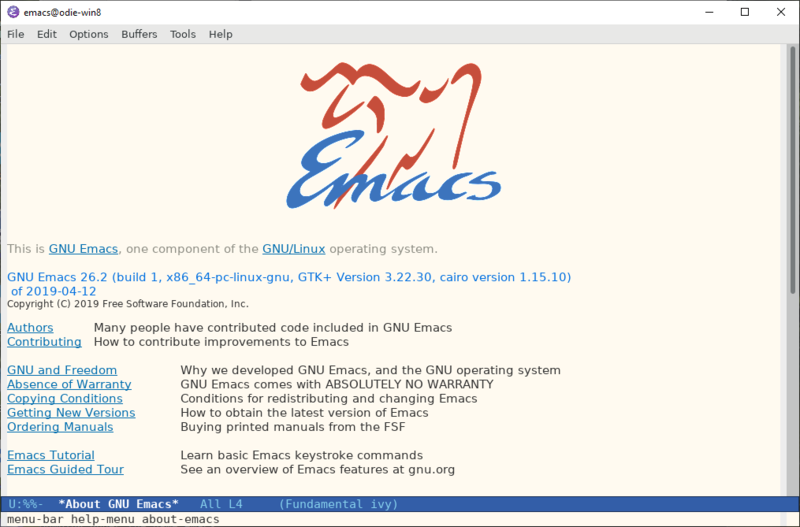 Following up my previous experiments with running Emacs on the Windows Subsystem for Linux, I naturally had to see how the latest version would work out. For that, I built the RC1 on an up-to-date Ubuntu WSL. I actually built it twice – once with the GTK+ toolkit, once with the Lucid toolkit. More on that later. The good news is that the text mode version works right out of the box, the same way it worked the last time. I only gave it a quick spin, but so far it looks like it Just Works. I’m experimenting with screen recordings at the moment and just out of curiosity decided to see if I can load and edit a text file inside the main Emacs process from inside an ansi-term using emacsclient. Spoiler alert – yes, you can. At least the way it is set up on my system, emacsclient doesn’t play with text mode (-nw) as it doesn’t recognise eterm-color as a valid terminal type, but loading and editing the file into the GUI works flawlessly.